Presidency Council head, Faiez Serraj said that the terrorist suicide attack on Libya’s Election Commission’s HQ would not distract Libya from democracy or its planned 2018 elections, Mohamed El-Sallak, his spokesperson reported (Photo: Presidency Council). The terrorist suicide attack on Libya’s High National Election Commission (HNEC) last Wednesday would not distract Libya from democracy and the planned 2018 elections. The reconfirmation was made by Faiez Serraj head of the Presidency Council through his official spokesperson Mohamed El-Sallak. Speaking at yesterday’s press conference, El-Sallak said that a commission of inquiry was continuing its intensive work regarding the circumstances of the terrorist attack on the HNEC. This is continuing with the follow-up by Serraj and the direct supervision of the Minister of Interior. In parallel with the investigations, a number of exceptional measures had also been taken to protect the headquarters of HNEC, he added. 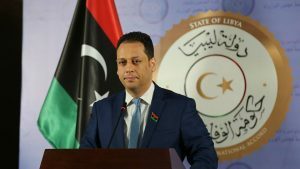 El-Sallak added that Serraj stressed that such criminal acts would not hinder the democratic process and the holding of elections, with the stress on the swift fulfilment of the constitutional entitlements based on which the legislative and presidential elections are to be held before the end of this year. Serraj further echoed this the next day at the opening of the Libyan-Italian Economic Forum. After paying his condolences and respects to the victims of the terror attack of the previous day, he added that it was a warning that Libya’s security challenge was still present. He had said that the HNEC terrorist operation was similar in nature to what was being committed in many Arab and European capitals, which needs to be addressed and ended through unified, regional and international efforts and coordination. Serraj had stressed that these terrorist operations will not discourage Libya from adhering to the democratic path that it has embarked on, and which these terrorists are enemies of.